Bags, dark circles, puffiness.... something I'm constantly battling with. I've been through alot of drugstore products in my time and I don't always think you need to spend a huge amount to get decent results and this is a perfect example. 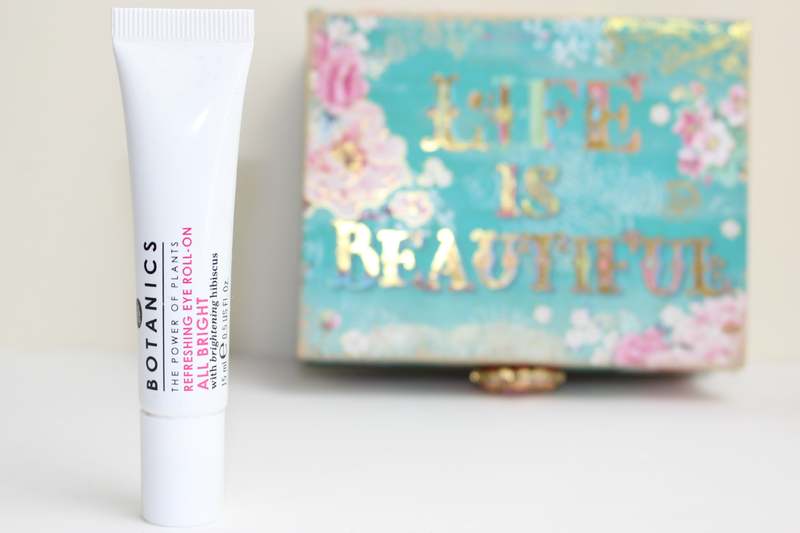 I'm a big fan of the Botanics range from Boots and I think alot of it is super underrated! This sqeeuezy 15ml tube is an easy roll-on product aimed at targeting eye puffiness and dark circles. The tube has a metal rollerball feature which helps to distribute the lightweight gel formula and immediately cools the skin to give it a lovely refreshed feeling. The hyaluronic acid helps to hydrate the dull and delicate skin and the hibiscus ingredient is a fantastic brightness booster. I've had a few days off of work recently so while I have been at home not wearing any make-up I have been taking full advantage of this stuff. This stuff is so lightweight and really wakes me up when I pop it on underneath my eyes. 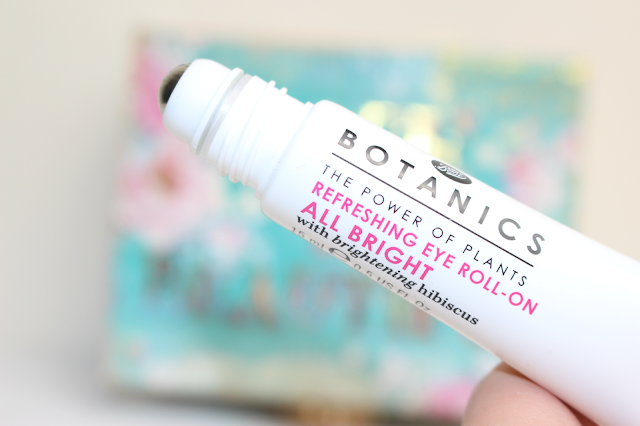 The All Bright Roll-On is usually priced at £8.99 but is currently half price in store and online, always look out for offers on the Botanics range, its not often that you have to pay full price! I've tried a cleanser from this brand I really liked it. Will look for this on my next Target run! This sounds incredible, I must check it out! half price is something I always love to see and I too suffer from all of the above. Need a new eye cream asap! I love trying new eye gels/creams! This one sounds so refreshing, I really need to give it a go. I've had really puffy eyes lately, so this sounds like something I definitely need! I love the Botanics range and this sounds really great - I'll have to give it a try! I think I've tried everything else in this range BUT this! I was hoping to see a review at some point. I'm definitely going to get this, I think.